With the addition of 4 new chooks to increase the flock to 8 hens, it was starting to get a bit crowded in Cluckingham Palace. I decided to do something about it over the weekend. Way back when Dad and I first built the extension to the nesting boxes/sleeping house, we only had 4 hens, so it was adequate back then. But times they are a changin, so I decided to make a little more space. This is what their house used to look like (the top board was in place before I started, I just forget to take a before picture before I started). 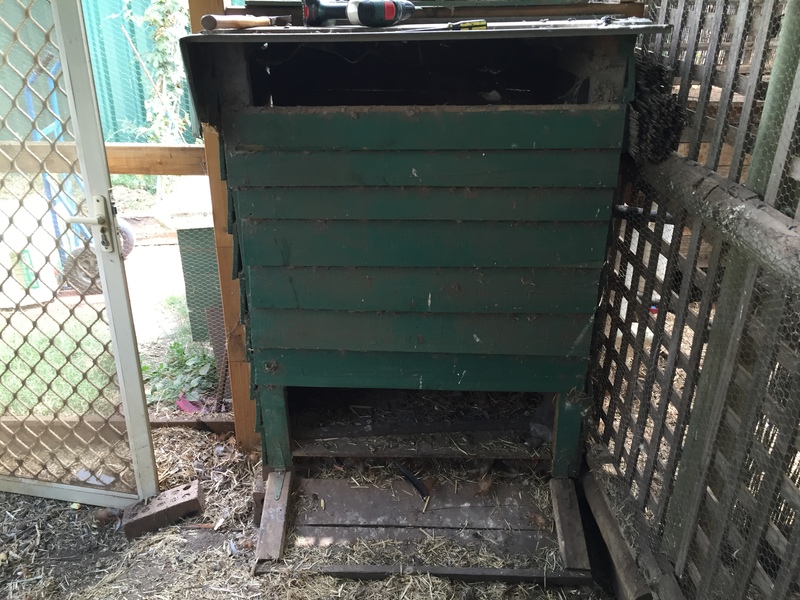 It was dark inside, hard to clean, and not enough space. 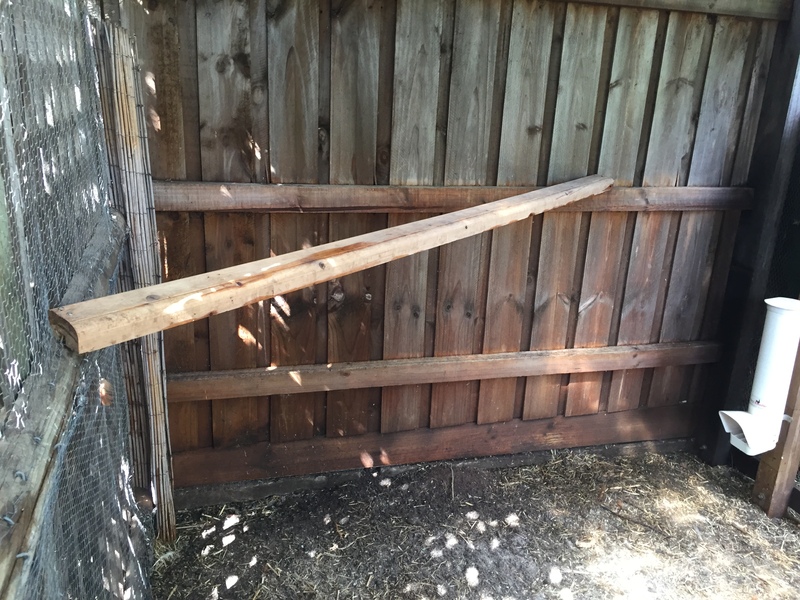 I figured that their cage was always locked at night time anyway, so I could not only remove all these boards, but get rid of the little flap at the bottom as well. Boards removed and new perch added. 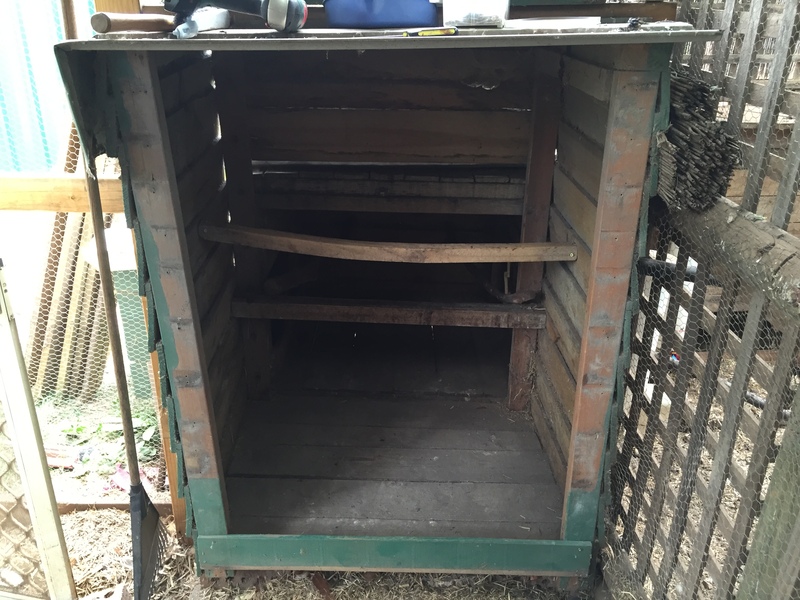 Once I removed the boards, the door flap, and placed them aside for later reuse, I was surprised on how much space there actually was inside. I fixed the taller perch in place with more screws as it had moved and was unsafe. Then I mucked out the house, fastened a kick board to the bottom so their bedding wouldn’t get scratched out, and replaced it all with fresh sugar cane mulch which is nice and soft. It was so easy to clean out. I just used a leaf rake then scooped up all the dried manure and bedding into a large bucket and piled it into a garden bed to dig in later. I also gave it a brush down inside and out with a stiff brush to remove any cobwebs and spiders. There were a couple of White-tailed spiders living inside, so I quickly dispatched them with the back of the hand broom because I didn’t want any chooks eating them and getting sick. 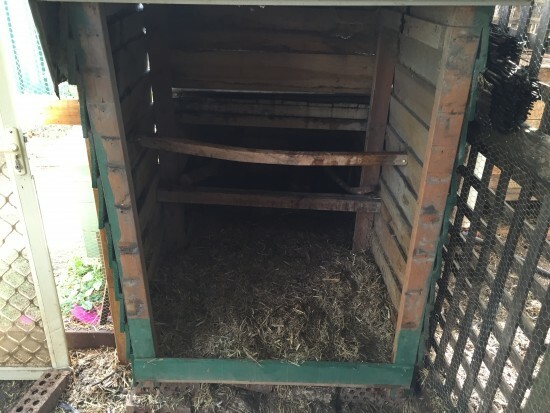 So now that there was more room at the inn, I also removed a garden bed that I had previously placed in the cage and had filled with sand and ash as a dust bath. The girls had other ideas and never used it, so I dismantled it and put it into storage until required. I then set about adding a big perch for them to rest on during the day. I had a long piece of cypress pine left of from a previous project, so fixed that in place at a decent height so they would feel safe. I fixed it in place with long screws at either end so it wouldn’t move. It’s a very solid piece of cypress so it won’t bow in the middle. One of the new girls decided to try it out after I gave Cluckingham Palace a wash down. 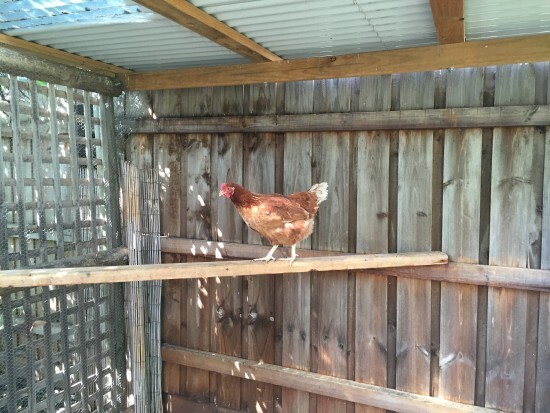 Once that was fully tested, I moved on to checking the chicken wire. There were some bits that had come away, so I used fencing wire pins to nail them back into place. Not that I had seen any foxes in our suburb, but better safe than sorry. So with the renovation completed, I took the time to just be. 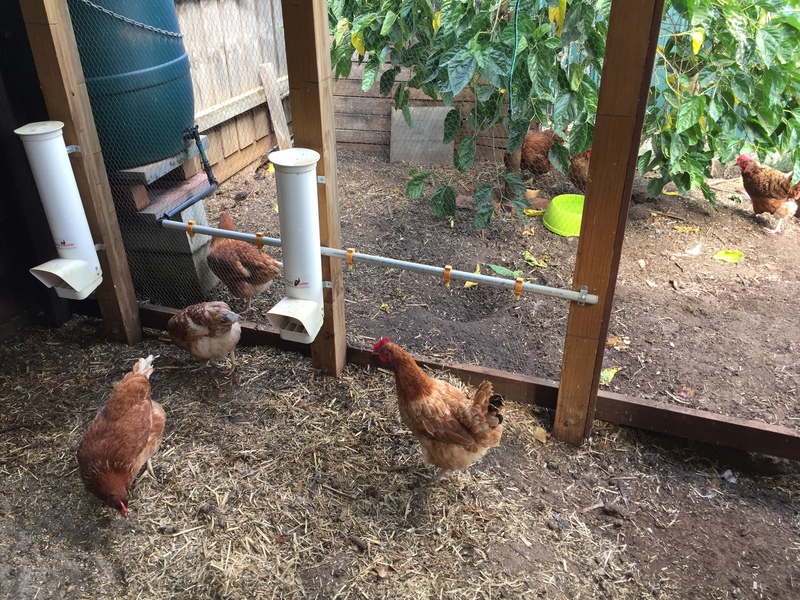 I pulled up an old coconut oil drum and sat and watched the girls in all their chooky glory and enjoyed the show. It is something that I should do more of because they are just so funny and it fascinating to watch the new pecking order develop. Well that was most of my Sunday activities which were long overdue. So glad that I got stuck into it and got the job done. 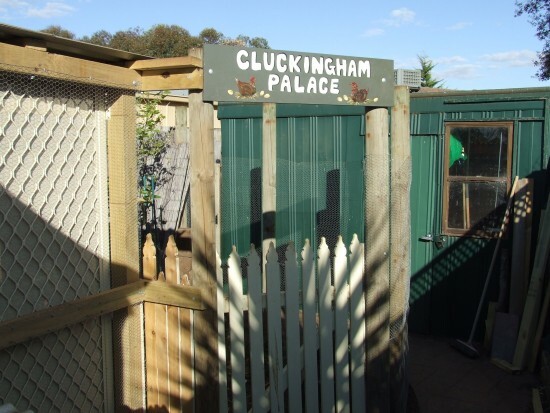 I’m very satisfied with the result of the Cluckingham Palace Renovation. I am really enjoying creating this specific green content. When planning for each episode, I trawl through the blog archives to look for simple and quick to explain methods to green up peoples lives. Something that can be easily explained in a five minute slot. Reading back through those old posts has been a blast from the past for me, and it helps to reinforce just how far I have come on this sustainable living journey. Anyway, on to this weeks episodes. As I mentioned there are three quick tips a week, published on Monday, Wednesday, and Friday mornings at 0700 Australian Eastern Daylight Standard Time (+11). So as not to spam the blog with each episode, I post a weekly omnibus containing all the episodes since the previous post. 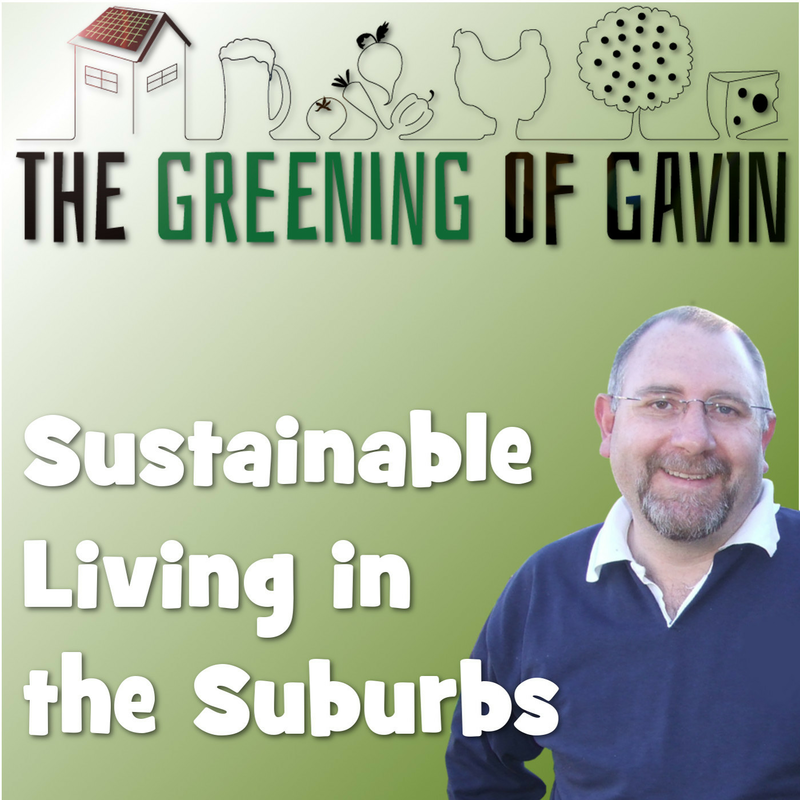 Episode Six; Green Quick Tips for breaking car dependency. Using your car less can save you money and the planet in the long run. Fossil fuel isn’t going to last forever! 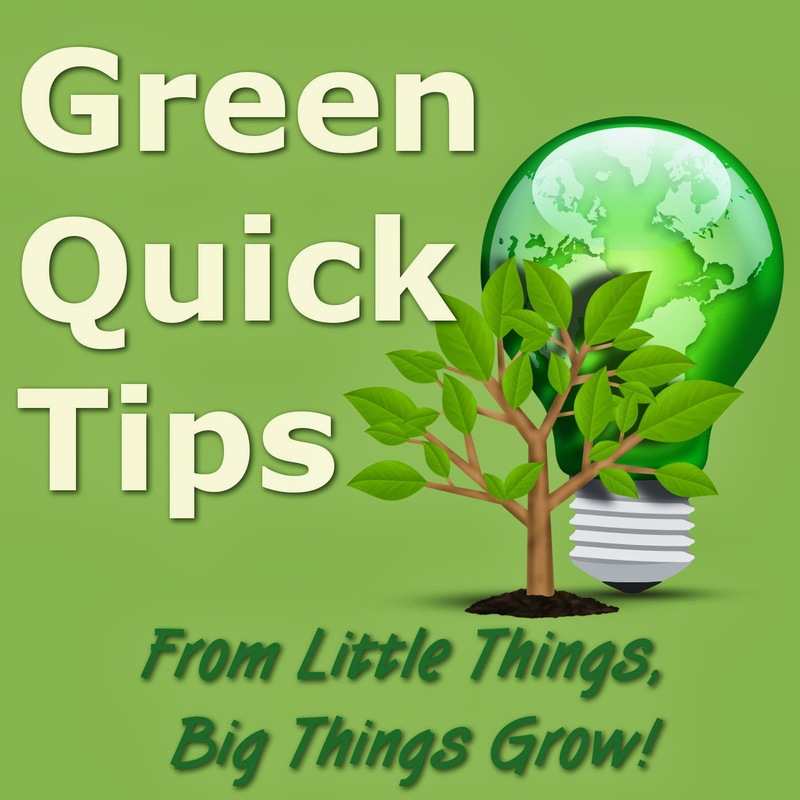 Episode Seven; Green Quick Tips for Green Cleaning. Two magic ingredients for green cleaning are baking soda or better known as sodium bicarbonate and white vinegar. So many uses for two simple compounds. Your home will also smell lovely! Episode Eight; Green Quick Tips in the Laundry. Greening up your laundry is easy if you follow a few simple steps. Not only will you lower your use of harmful detergents, you can save water and electricity as well. Also, as Apple have accepted the podcast in the iTunes directory, you can now subscribe using the button below. Until next time, stay keen and go green! Hope you are all having a great holiday so far! 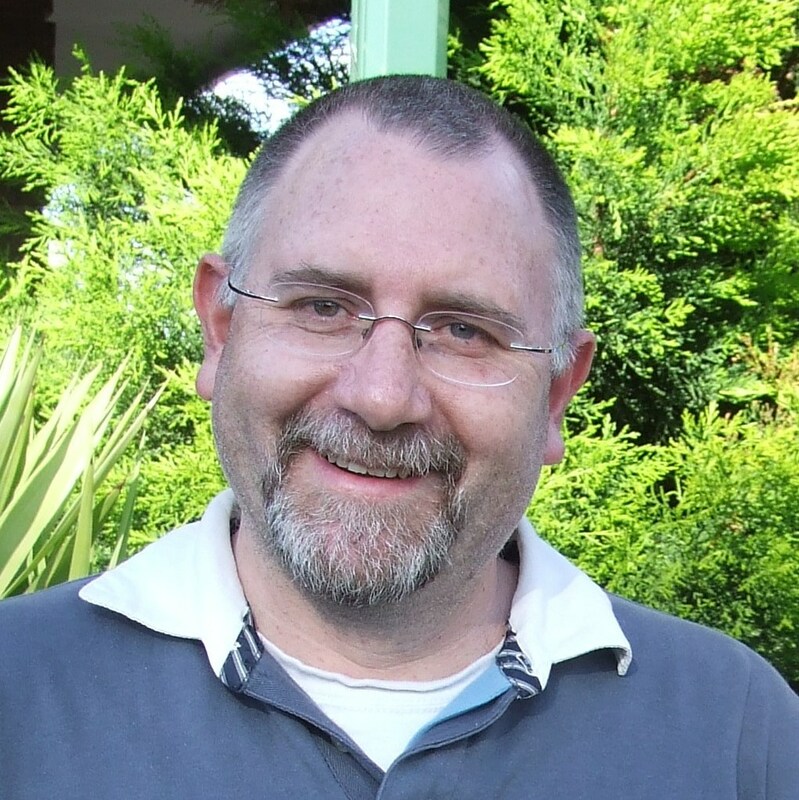 This post was originally published in December 2012, and had a great response from readers. If you have any eco cleaning tips, please feel free to share in comments. Just for the holiday break, I am allowing Anonymous comments. If you do choose to leave a comment using this method, please leave your first name, so that when I reply, I don’t have to guess or make up a name (which I will). Cyber hawkers and spammers will be deleted instantly. What would you say if I said I could save you at least $20-30 off your fortnightly shopping bill by following some simple cleaning tips? Just by using natural cleaners that you can make yourself, you will save money, and keep nasty chemicals out of your waste stream that would otherwise make its way into our waterways. Easy peasy, lemon squeezy! Since our family started the journey towards a more sustainable lifestyle, our cleaning methods have changed towards non-toxic products with obvious benefits. We started using grey water at the very beginning of the journey to water the garden, so we needed to change our laundry powder to one that had no Phosphorous and no Sodium so that we could use the water neat in the garden. The phosphorous would have damaged the native Australian plants, and the sodium tends to make the soil repel water, and increases the salinity. Also, any run-off that the plants don’t use, does not contaminate the ground water. We found, after trying a couple of NP brands, that the Planet Ark Aware laundry powder worked the best for us. Earth Choice came in at second when we can’t source Aware. After reading an article in Choice Magazine, we found that it was not made from any petrochemicals, but there are probably similar brands now around the world. Kim raves about it to anyone who will listen, because a 1 Kg box lasts her approximately 8 weeks for 4 peoples clothes as you only use 3 tablespoons per wash. We also use a NP fabric softener, but don’t use it very much, and have been substituting with white vinegar in the last two months with great results. When washing towels, Kim pops in a few drops of eucalyptus oil to kill of any bacteria. It makes them smell nice too. I believe that Seventh Generation also have a good product rain in the US and Canada. With the laundry sorted, we looked to the kitchen. We buy an earth friendly washing up liquid for the kitchen dishes that is also low in phosphates and sodium. We still use the dishwasher occasionally when we have a mountain of dirty dishes. 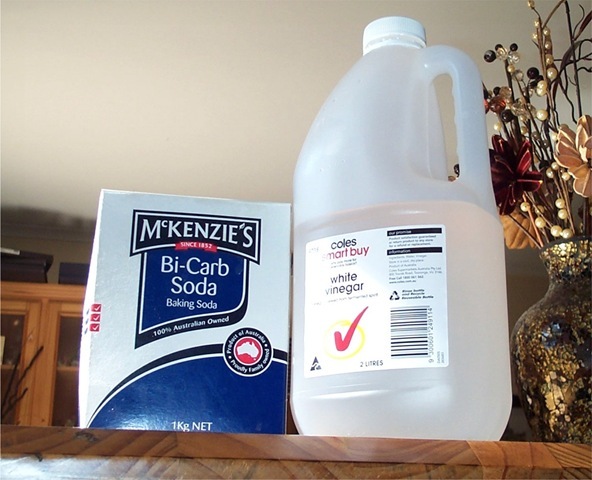 We use bi-carbonate soda (baking soda) instead of dishwashing powder, and vinegar for the rinse aide. We have found this to be very effective, even on some of the tougher dirt. To get rid of a smelly dishwasher we give it a thorough clean with vinegar and bi-carb soda, then put it through a cycle. So we are not only saving a fair bit of water, and about 8 kWh of electricity a week, and caustic dish washing tablets, but we have also realised something profound. When you wash dishes by hand, and you have someone drying them with you, you actually talk to each other and everything is cleaned far better than it would have in a dishwasher. Not only do you have quality control via an instant feedback loop, you can have a laugh and a joke around at the same time. There is only one rule that we stick to, and that is that the cook does not wash up. You can shotgun for the rest of the washing, drying or putting away! 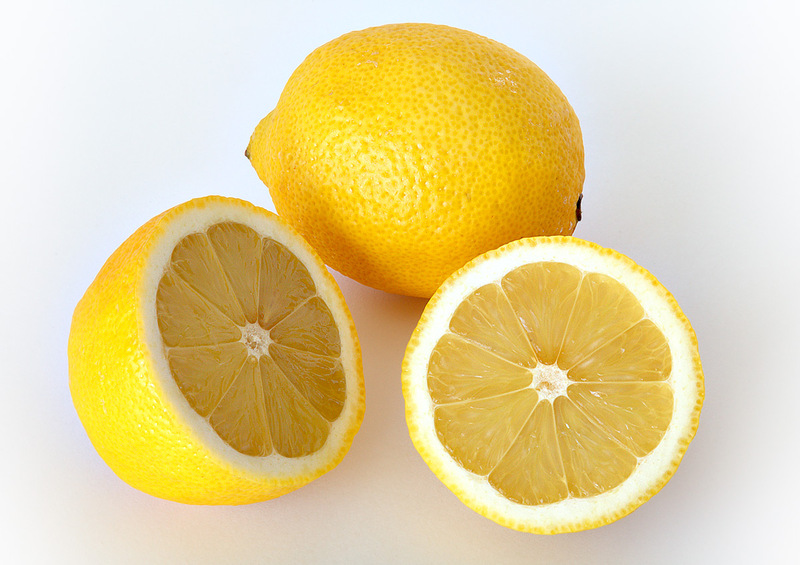 Lemons and bi-carb soda are also great for getting rid of stubborn burnt on food at the bottom of pots and pans. When life gives you lemons, scrub a pot with them (or make Limoncello)! Cleaning windows and mirrors is a cinch with white vinegar in a spray bottle and the free local newspaper. Not only is it cheap, but it keeps mould away, and prevents mirrors from fogging up. It gives a nice clear finish without any smell. You can throw that Windex away now! We also use white vinegar as an anti-bacterial to wipe the kitchen surfaces when dirty. Stubborn stains are dealt with by a paste of water and bi-carb soda. I would rather have a small child accidentally swallow vinegar than some of the other nastier cleaning products kept under the average kitchen sink! If I have an abundance of lemons, I use one cut in half to clean chopping boards before giving them a coat of olive oil. About a month ago we had a bad smell coming out of the kitchen sink, so it was out with the bi-carb soda, and down the drain with about 4 tablespoons of the white powder. After about a minute I followed it up with a quarter of a cup of white vinegar and let it all fizzle. Let it go for about 3 minutes and then flush with some very hot water. Our drain have never have smelled so nice, and I may have gotten rid of a lot of built up grease as well. The last cleaning thing I can think of is that my daughter Megan gives the shower a weekly once over with some paste made up of bi-carb and water, with an micro-fibre glove and old rags, which gets rid of the soap scum that collects there. A little bit hot water afterwards washes it all away. Oh, I forgot the toilet. We use bi-carb soda to clean it as well, with a little white vinegar in the final flush. As for washing ourselves, we all use pure, home-made soap. I even wash my very short hair with it. Kim uses an organic shampoo, but I have heard that bi-carb works just as well in very small doses. 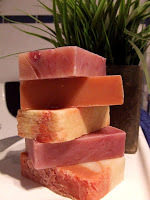 I shave with a pigs bristle brush, having given away shaving cream in a can (just use our home made soap to lather), but am having trouble finding an alternative to disposable razors or blades. I don’t shave very much, as I have a goatee, so I would not use as many blades as the average guy. I might investigate a cut throat razor in the near future, as they last for a very long time, and you sharpen (or is it blunt-en) it yourself. Sweeney Todd eat your heart out! Well that is about all I can think that we use. We simply asked the question to see if the answer was that if things were safe for us, they would be safe for the planet. We made the changes slowly over the course of about a year. If you have a couple of bottles of white vinegar and a big box of bi-carb soda, you have almost all you need to clean the house up. I did get most of the tips originally from reading Greeniology: How to Live Well, be Green and Make a Difference. Tanya Ha wrote a whole chapter on green cleaning. It helped finding all the good tips in the one place, and the tips were simple to implement (I even met her once (more like stalked), and got my copy of this book autographed). 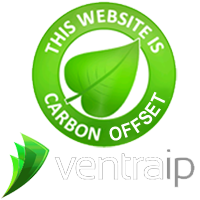 We save so much money on cleaning products (vinegar and bi-carb are cheap as chips), we feel safe when we clean, and know that it is better for the planet. 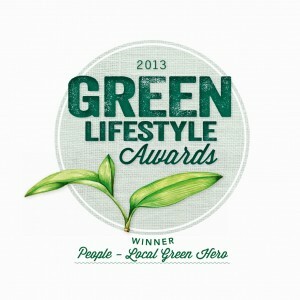 Simply the simplest and greenest products we could find make a hell of a difference! Do you use a natural green cleaner? Do you have any tips that you can share? I am sure readers would love to know.